June 4, 2015, Beijing, China – nubia www.nubia.cn, a high-end Android smart phone manufacturer, unveiled today its flagship 2015 device in the U.S., the nubia Z9 – a leap forward in borderless styling and ease of use for Android smartphones. The nubia Z9 boasts pioneering new features, including a visually borderless screen, easier Android smartphone controls for a superior user experience with reduced steps to accomplish a task, an ergonomic design for easier holding, 16 MP camera with Image Stabilization, and fingerprint sensor technology. Available Q3 2015 in the U.S., the Z9 comes in three models priced from $564 - $725. 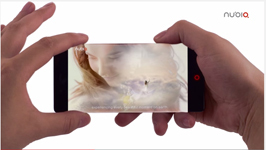 See video with nubia Z9 features: https://www.youtube.com/watch?v=3zmA9qjBqjM. The most impressive features of the nubia Z9 are the visually borderless 5.2-inch full HD screen and the Frame Interactive Technology for a simpler user experience. The nubia Z9’s arc Refractive Conduction Technology (aRC) provides more dazzling visual effects than any other smartphone of similar size. The borderless design not only provides amazing aesthetics, but is also a step forward for users wishing to use their smartphone in a more interactive way. By adopting nubia’s Frame interactive Technology (FiT), the nubia Z9 allows users to control their phones by using grip and gesture based controls, such as touching the edge of the screen. For instance, users can quickly launch the camera feature by simply turning the phone sideways and placing four fingertips on the edge of the screen or take a one-handed selfie by squeezing the handset without touching any buttons. With FiT technology, users will reduce the average smartphone process to 2.7 steps as compared to traditional smartphones. In addition, the nubia Z9’s new ergonomic design makes it easier to hold the phone and less likely to drop it. Other major features of the nubia Z9 include a sophisticated high-resolution 16MP camera with OIS (Optical Image Stabilization), Snapdragon 810 chipset, 2900mAh rechargeable battery, 5.2-inch display with Full HD (1920 x 1080) resolution, and Android 5.0 Lollipop. The nubia Z9 will be available in black and gold Q3 2015 in the U.S. at select retailers and online at www.nubia.cn. It comes in three different models, Classic: with 3GB RAM and 32GB storage for $564, Elite: with 4GB RAM and 64GB storage for $645, and Exclusive: with the addition of fingerprint sensor technology for $725. For more information, see the website: www.nubia.cn.